The National Council for Social Service (NCSS) provides leadership and directions for the social service sector in Singapore. It aims to ensure every person in society has the opportunity to live a life with dignity and realise their fullest potential. In order to drive social change in Singapore, the social service sector needs passionate individuals who possess exceptional leadership qualities and commitment to serve their fellow Singaporeans. NCSS thus offers the Social Service Scholarship to groom individuals and offer support to them as they deliver their talents. Upon graduation, NCSS scholars will be emplaced in a Voluntary Welfare Organisation (VWO). 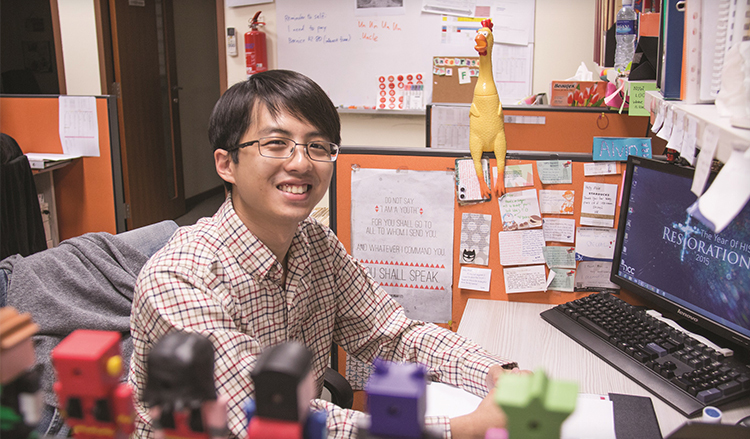 Social Service Scholar Alvin Mak is one such passionate individual. He tells us how his scholarship opened his doors to what he had always wanted - a rewarding career that allows him to journey with and witness positive changes in his clients. Growing up, Alvin faced multiple difficult periods. In spite of his difficulties, he counts himself fortunate to be surrounded by people who have encouraged and journeyed with him. Being on the receiving end of such affectionate gestures sowed the seeds of his interest in the social service field. He saw the Social Service Scholarship as an instrument to facilitate his university education and future career. He tells us about his university experience cheerfully, "During my undergraduate days, I had the opportunity to attend an exchange programme at the University of British Columbia, Canada's School of Social Work. It was there that I gained a better understanding of how social work is carried out in a wholly different culture. The entire experience broadened my horizons. "I appreciate that I managed to gain insights into the field through my lecturers and receive cherished advice derived from their years of experience. This is something that University textbooks or lecture notes can never offer!" Alvin's scholarship journey has well-prepared him for his work environment today - one in which no two days are the same. After all, every single client enters his office with a unique set of issues and circumstances that require special attention. According to Alvin, it is important for Social Workers to take time to build good rapport and a relationship with each of them. Once established, these relationships can present meaningful engagements that will bring out the best of both parties. Alvin shares, "Personally, I like the dynamic nature of our work! We do get curveballs thrown our way when we least expect it but what really matters is how we intervene strategically for more fruitful outcomes." According to Alvin, the resilience to carry on with undaunted optimism is key. Alvin tells us how much he values the strong support network built by him and his colleagues. He tells us, "We have developed a habit of pasting encouraging notes on one another's walls and desks, as reminders of the good work we have done. These things keep us motivated. "I believe working closely to achieve similar end-goals in the social sector has made us more like-minded and empathetic. This empathy allows us to lend one another mutual support in tough situations and I am beyond grateful for that!" CAG Local Undergraduate Scholar Amanda Thng tells us how she is contributing to the influence of the Changi Experience!